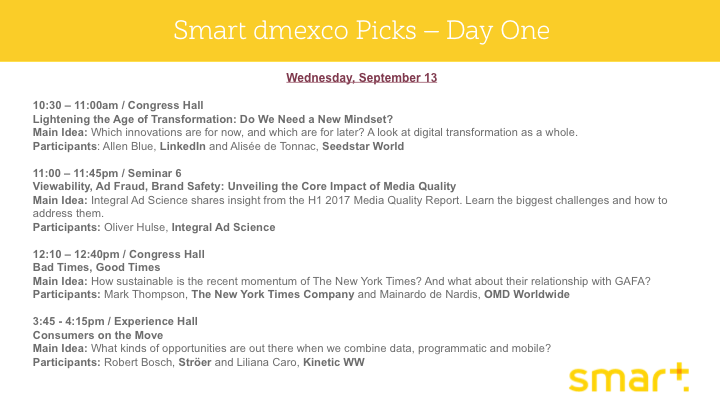 dmexco — the German digital advertising trade fair and conference — is billing itself as the most important meeting place for techies, visionaries, media professionals and creative people. If you’re attending, your bound to have plenty of meetings, cocktail parties and dinners planned already. 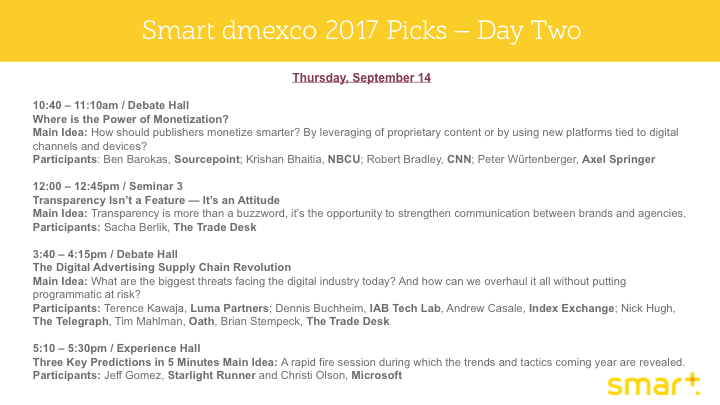 If you don’t have the time to plod through the hundreds of sessions to find the most interesting ones, check out our Smart dmexco 2017 Picks! We’ve chosen just the right mix of talks, keynotes and roundtables to keep you up to date on the latest trends in ad tech. Lightening the Age of Transformation: Do We Need a New Mindset? Main Idea: Which innovations are for now, and which are for later? A look at digital transformation as a whole. Main Idea: Integral Ad Science shares insight from the H1 2017 Media Quality Report. Learn the biggest challenges and how to address them. Main Idea: How sustainable is the recent momentum of The New York Times? And what about their relationship with GAFA? Main Idea: What kinds of opportunities are out there when we combine data, programmatic and mobile? Where is the Power of Monetization? Main Idea: How should publishers monetize smarter? By leveraging of proprietary content or by using new platforms tied to digital channels and devices? Main Idea: Transparency is more than a buzzword, it’s the opportunity to strengthen communication between brands and agencies. Main Idea: What are the biggest threats facing the digital industry today? And how can we overhaul it all without putting programmatic at risk? Three Key Predictions in 5 Minutes Main Idea: A rapid fire session during which the trends and tactics coming year are revealed. Click here for the Day One slide. Click here for the Day Two slide.